I’ve been working on dungeons for a while now, so I think it’s time to get back to gameplay stuff and feedback. Namely, I want to start doing some HUD/UI work. The big picture is that I am going to keep it very simple and add only the crucial HUD stuff. “It’s there because there is no better way to show it.” I am not actually 100% sure what I need in the HUD because I don’t have my gameplay finalized. 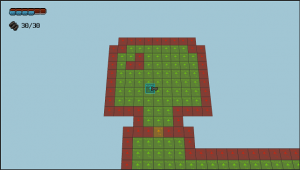 It’s all gravitating towards heavy gunplay, so that’s what I’ll plan for the HUD. I want some RPG elements (inventory, levels, stats) too but I will not add any of that yet unless I actually get to implementing those. The big part of work at this point is to wire it all in the game to the actual player’s vitals. A new HUD system, new HUD canvas and camera, scripts to connect it all, all the initialization and update pipelines, relevant value change events and updates, proper world initializing and restarting, etc. To note, I have a custom layout script that knows how to lay out all its children in a specified direction, here – left-to-right. That way I don’t need to bother manually spacing things out every time I need things to arrange themselves in a row (or table). Of course, I need to implement shields and armor in the game first. There’s a lot of ways to do this, but I think I will just do the same amount/max amount as health does. I will also make incoming damage hit shields first, then armor, then health and overflow from one to the next correctly. I don’t know yet what the actual gameplay for this is. I can imagine some abilities or items that might give you armor or shields. I am keeping a background for shields and armor visible, implying a certain maximum from some source. I’m not sure this is actually how I would do this. Although it does make it clear what the total extra protection was before it depletes. For example, a depletable armor item. I don’t really know where I want to put the player’s info HUD elements. Top-left is the arch-typical retro-y location. I could consider other corners or having a settings option for this, but I think I will just go with the basic recognizable style. My camera is also leaning back, if that matters. I don’t think this is an area where I need particular originality. The blinker has two options: the hang time (initial full opacity period) and fade speed (gradual lerp speed to 0). A blinker can be “reblinked” and it will go back to full. One visual problem is when the segment “damages into” the next segment — this causes the blinker to jump abruptly between segments (can be seen in above gif). This is even worse if one takes a multi-segment damage, like some boss getting owned by some ultimate ability. Abrupt UI changes is something I really dislike. The GIFs, so many GIFs! I am complicating my UI code with the blinker logic, but I also don’t want my health bar to be the one doing this. This is something I can write once and then reuse elsewhere, if not in immediate HUD. Will I have powerups? I don’t really know. I’d like to, but it’s a significant time investment into gameplay that I might not have time for. I might do some simple re-usable ability, sort of like a mana bar. Now, I need to somehow indicate that the bar is “active”. In case of the power bar, it mean the power is currently active. I can use a white background sprite that’s slightly bigger than the bar for this and stretch it to fit. This way it gives a little “friendly” indicator when gaining stats happens, which isn’t as intrusive as the stat loss blink. We’ll see how this feels and I’ll likely tweak it, though I won’t cover any minor changes I do. With that, I think I am coming to the end of the persistent HUD elements I need. I can’t think of anything else I really need (not that I really needed all that flashy feedback). And the things I can think of are just feature creep. The bottom-line is that I don’t have the art resources to have many HUD elements, so I have to be conservative. 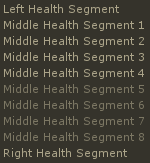 I will still need UI menus and such for the game, but that’s a separate blog post.